Click on it to make it a lot bigger. for the last 6 years of Triple Crown prep races as well as the winning figures f or the Kentucky Derby, Preakness, and Belmont Stakes for each 0f those years. The races are plotted chronologically. The thicker line and listed figures in the chart are those for the 2015 winners. American Pharoah’s Kentucky Derby? We rate it the fastest in the last 6 years. And his Preakness? We rate it second fastest. The top TimeformUS Speed Figure for any Triple Crown race of the last 6 years was I’ll Have Another’s 130 in the Preakness. The Factor ran the same figure in 2011 Southwest. The Southwest at Oaklawn was run in 2 divisions in 2012; we’ve used the higher TimeformUS Speed Figure for the above chart. 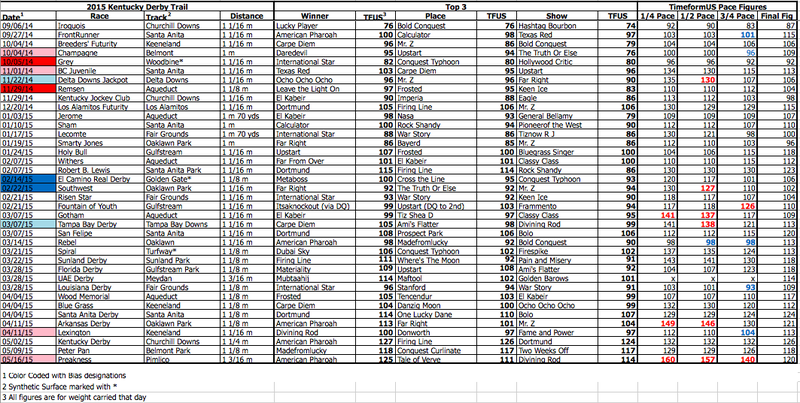 This chart reflects our recent alignment of our Speed Figure Scale to better harmonize with the Timeform Global Scale. Read more details here. How TimeformUS Speed Figures work. Image | This entry was posted in Data Studies, Product features, Race Previews. Bookmark the permalink. How did I’ll have another who ran the Preakness in 1.55.94 get a figure of 123 when California Chrome ran in 1.54.84 and received a 116?? Short answer: The surface at Pimlico was slower the day of IHA’s Preakness.